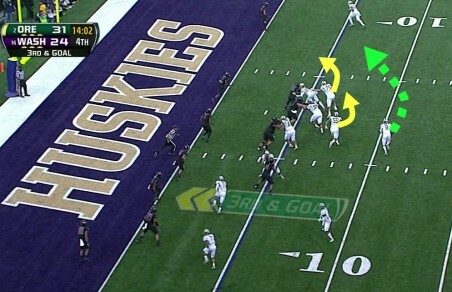 Did Helfrich’s Game Plan “Chip-Away” at Washington? Oregon fans that read this site have become accustomed to the unusual game plans assembled by Chip Kelly, and we have had some dandies to study over the years. The natural question concerns whether new Head Coach Mark Helfrich would do the same? Justin Wilcox had faced the CK game plan last year, and he had better defensive personnel this year to slow down Oregon, yet I saw some surprises that, I personally could not have anticipated and, HAD to have given the former Duck headaches. How much has Helfrich learned from Chip? 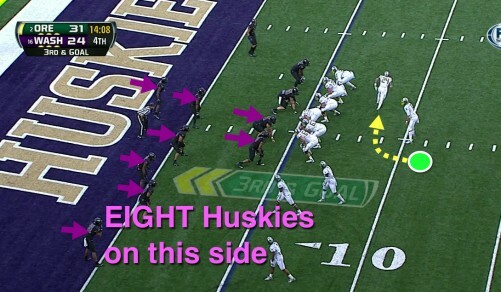 Let’s look at a very innovative game plan for the Huskies and ponder just WHO WAS preparing the game plans of the past? 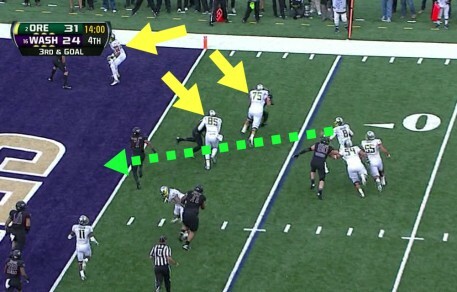 We see (above) the beginning of a typical play of the Oregon offense with the RB in an Inside Zone Read backfield formation, and a WR (Addison) who was flanked out and beginning to go in motion (yellow dotted arrow). I can only imagine that the Huskies were more surprised than I to see the RB take off to the left as a lead blocker and Addison taking a Fly Sweep pitch from Mariota! This play was a HUGE yardage gain as we had hat-on-hat blocking at the point of attack and the element of surprise helping to pop this play for more! Great running and high step by Addison (No. 11 above) and overall blocking put us in scoring position. Note how Jake Fisher (No. 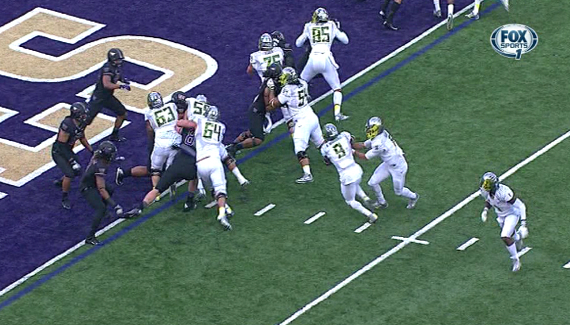 75) just shoved the fast, small middle linebacker of Washington (No. 10) to the ground. You gotta love all the players on the turf! After the game I came back to that play because it was vaguely familiar . . . I could swear we ran this play, or an offshoot of it in the past. It hit me! In the Sun Bowl of 2007 — we were making the best of what we could at QB with Dennis Dixon and Nate Costa out with injuries, and in order to help confuse the defense of South Florida and slow it down for Justin Roper? Yep, we ran a Fly-Sweep series as you see above. In this related play (above) Roper faked the pitch to the WR/Fly running past and handed it off to Jonathan Stewart instead. Good times! 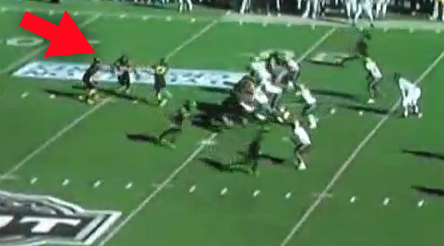 Oregon is in the red zone and driving (above) as you see Thomas Tyner (No. 24) go from an Inside Zone Read backfield formation to going in motion to become a flanker at the top of the screen. 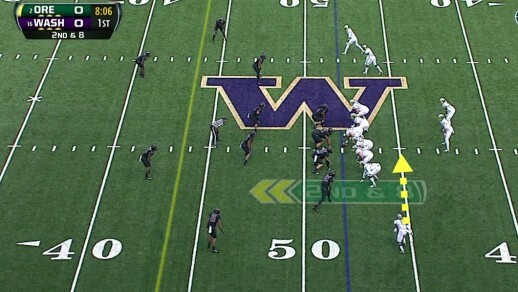 With our formation on the left side — note how there are EIGHT Huskies lined up on the left side of the Ducks’ center. Now we have an empty backfield (above) with four WR/RBs flanked out and that always means a pass is coming? I would think so if I was in purple that day, but Marcus takes the snap and begins running to the right! Look how Grasu (No. 55) and Fisher have pulled, as we do in a Sweep Read — thus with no read, it’s a QB Sweep! The yellow arrows (above) show the blocking of Tyner (top of pic), Pharaoh Brown (No. 85) and Jake Fisher — here especially enjoying laying the wood — Mariota sees an excellent cutback lane and moves toward it (green dotted line/arrow). Marcus is fast enough (above) to get into the end zone by following his blocking! 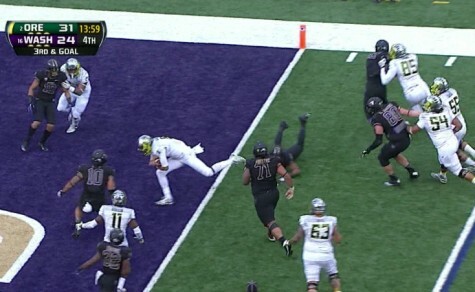 I was thinking back to when I last saw this play, and it was the USC game of last year! 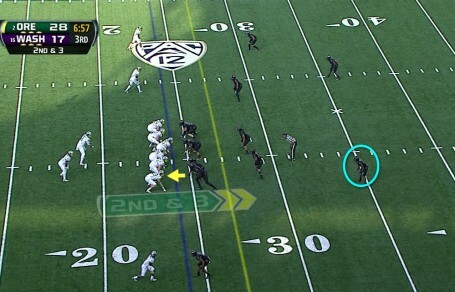 Helfrich tucked this play away and did not use it again in 2012 — and not this year, until now. Nice to see that uncommon play again! Imagine my shock to see a Tight End (Pharaoh Brown, above) flare out for a Bubble during the game. When I look at film later I see that it is an Inside Zone Read first, and then Mariota is checking to see the depth of the safety for covering the TE Zone Read. Since the safety (light blue circle) is close to the tackle box . . . Marcus is handing off. The stretching of the defense (above) by the Bubble threat helps to set up blocks for a first down for Tyner from the IZR play. We are used to seeing Bubble Zone Reads with WRs, but not TEs, but it DOES utilize the athleticism of that position group. 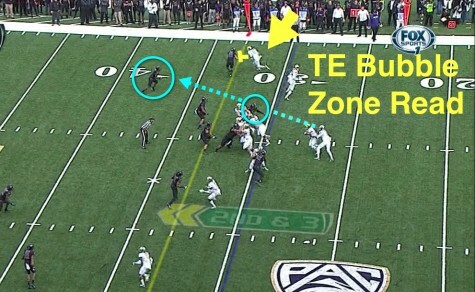 What an interesting new twist, as it is an Inside Zone Read with a Tight End Bubble threat instead of a Wide Receiver! Wow. As we start this play above — note we have a TE on the right side (Johnny Mundt, No. 83, with yellow arrow) and the safety covering him is deep beyond the tackle box (light blue circle). Why? 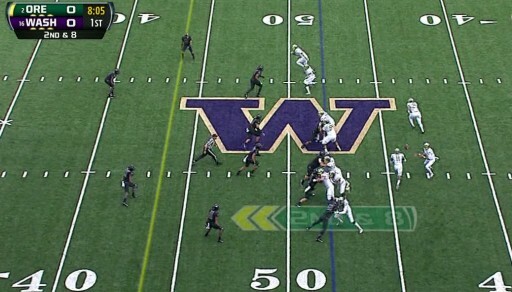 Oregon burned Washington with multiple long and mid-range passes when they crowded the box earlier in the game. Their third-degree burns make them more reluctant to come up for run support now. 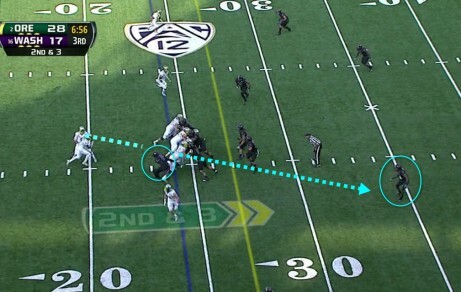 As Oregon begins the mesh (above), Mariota is Zone Reading both the DE and the safety again, as before. 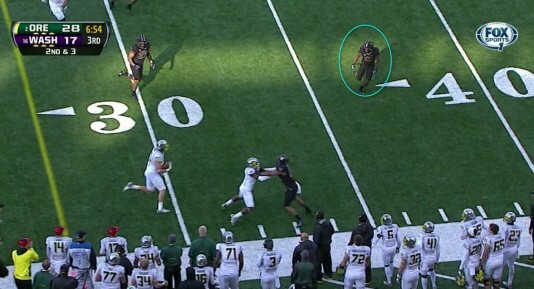 He sees a safety that is too far away from Mundt, thus Marcus is pulling the ball out of the mesh. 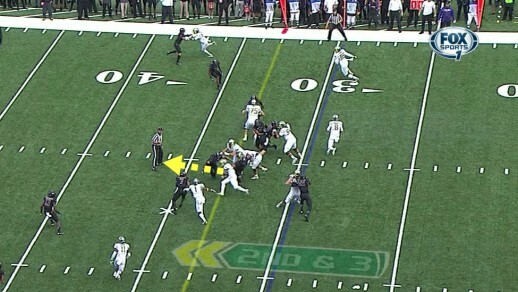 Mariota flips the ball to Mundt, as the safety (light blue circle above) is WAY too far back to stop it. In the past, two high safeties meant we would run the ball, but now we have added a new Zone Read for a short, safe pass to also take advantage of a high (distant) safety. 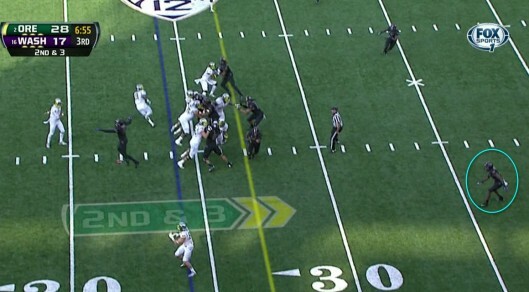 Mundt has the ball (above), a WR blocking downfield for him and a safety that won’t make contact until he is nine yards beyond the line of scrimmage. This play went for 13 yards total on a simple read, and I love the new concept. The coaches have new ways to make the defensive strategy against the Ducks “wrong” no matter what they do! My friends, the game plan for Washington included a play from 2007, a play from one game last year, and then a play that we have not seen before! If you are the Huskies Defensive Coordinator Justin Wilcox, how do you prepare for them? Did these plays alone make the difference? No, but adding them kept drives alive and added to the mental fatigue of the Huskies defenders. They would be asking themselves questions, such as “Did I cover the right gap?” “Will we have enough time between plays next time to adjust?” “What else am I going to see that I haven’t prepared for?” It makes you tired thinking about it. It is becoming evident to me that it WAS the entire offensive staff creating the game plans with Chip in his years here. Why do I think that? The strategy of pulling out old stuff or creating new plays has not changed from since Chip left. Plus — you need a sense of history of the Spread Offense at Oregon and knowledge of what we did and when. And THAT, my friends, can only come from a very experienced staff that was here through those years!